In June, the National Religious Retirement Office (NRRO) distributed $25 million to 360 religious communities to aid in the care of senior members. The funds were made possible by the annual Retirement Fund for Religious collection, which benefits elderly Catholic sisters, brothers and priests in religious orders. The most recent appeal raised just over $28 million and was held in a majority of U.S. Catholic parishes in December 2017. The NRRO is sponsored by the Conference of Major Superiors of Men (CMSM), the Council of Major Superiors of Women Religious (CMSWR), the Leadership Conference of Women Religious (LCWR) and the United States Conference of Catholic Bishops (USCCB). 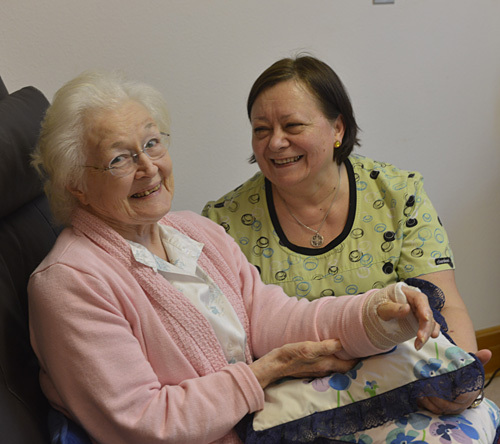 Pictured above: Benedictine Sister Julia McGanty with caregiver Jagoda Milewska Connolly.